For my latest short, I require a shot that is rather ambitious. Imagine from a fixed perspective in the middle of the hallway at ceiling level following a young boy running through the corridor, the camera follows his direction on a single axis moving with the length of the hallway. As the boy runs under the camera the movement continues to follow him from an upside-down perspective until he reaches the other end. Im trying to come up with a mount/rig that would allow a fully kitted fs7 to be in that position without leaving any permanent damage to the location itself. the hallway is quite restrictive on space. Im willing to scrap the shot if its impossible but it fits the mood perfectly. I've considered a few methods but they add quite a few specific requirements for the location (such as two doorways placed perfectly opposite from each other, and rig a bar across the hallway at roof level) if anyone can come up with an effective method of mounting I will love you forever. 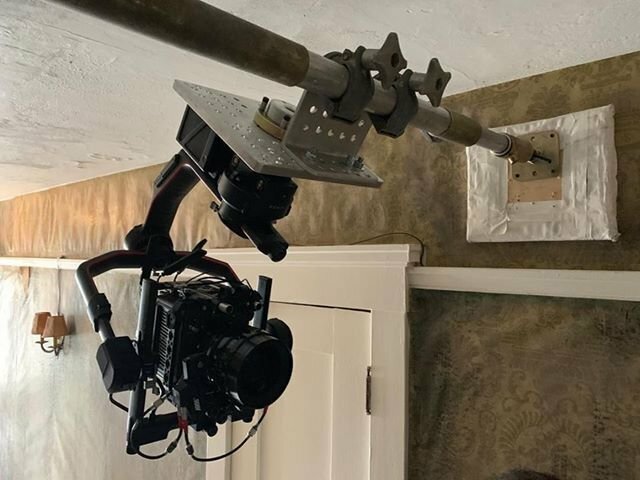 My first thought would be to rig a Movi to the ceiling, that would allow for the remote tilting that you would need to achieve the shot you're looking for. As to how you'd rig it? That depends a great deal on the corridor you use. Though it may be possible to do it with something as simple as two autopoles spreading the load between them. gimbal suspended from a wide handle shaped like an upside-down U (speed rail, wood, whatever it doesn't matter). Long enough "legs" on the U so the grips can hold it comfortably while the crossbar is as close to the ceiling as possible. Have them run the length of the hallway. The width of the crossbar should naturally minimize up/down translation while the gimbal stabilizes everything else. And you can remote operate the shot. No rigging. A lambda head would require operation, but maybe there's a way to attach the gimbal to the bottom. At that point, you'd still need a pulley or some way to operate the slider. I just re-read your post.. You don't need a slide. So that simplifies it, but maybe the above is worth pondering for someone else. +1 on just attaching the remote gimbal to the top. Here's a solution I've used a few times. In an ideal world, you should do this with two pipes so that your baseplate is more secure, otherwise depending on your tilt speed and your lens, you might see some wobble. You are partially limited in this setup with the wall distance you have available, but doing speedrail extensions is usually not a problem.